Illness is a nasty word. It’s not its fault, as language itself has no will or guilt, but it’s a fact that the mere mention of it evokes uneasy feelings. No one enjoys being “ill”, and even in the odd circumstances when a one-day bug might save us, temporarily, from a dreaded exam or social event, it is never an experience we would rush into repeating. These sensations extend to everything related to illness: Many people avoid seeing their GP, find hospitals distressing, switch the channel whenever a medical drama pops in… and yet most of these people usually don’t blame GPs, hospitals or dramas for their distress; they follow medical advice when they get it; and they actively support family members and friends at those moments where illness strikes. They know, in summary, that the feelings brought upon by uncomfortable concepts should not irrevocably dictate their daily actions. Unless, of course, another dreaded word strikes: “stigma”. While “stigma” in its classical origin referred to any sort of permanent body mark (like a scar or tattoo), its current use is to indicate something shameful. Why should illness be shameful? Well, as the philosopher said: “ask yourself”. In many cases this is caused by our social or moral views, and there are many conditions which most people don’t feel comfortable in disclosing to others for fear of the consequences. Worldwide, the majority of these involve mental health, as several charities have recently highlighted, including the Mental Health Foundation, MQ and Time to Change. While the fight against stigma has been carried out in the trenches of healthcare professionals for the past 50 years, the fact that mental health is an integral part of physical health makes necessary for everyone to be involved somehow. This is where our proposal comes in. A large part of the stigma around mental health comes from our popular perception of it, as people with mental health conditions are traditionally imagined in extremely prejudiced ways. News reports have undoubtably been a guilty part of this, though they seem to be improving lately, the same as literature, music or TV. However, the most popular form of entertainment in terms of revenue, video games, lags in this regard. A study from 2016 found that video games often repeat the mistakes that other forms of popular culture used to make when depicting fictional characters with mental health problems. However, some video game developers have recently spoken up about challenging these portrayals, such as the studios Ninja Theory or Dontnod Entertainment. We believe, as self-professed video game fans, that these attitudes are the way to go forward, and that video games can promote positive views of mental health conditions that avoid the stereotypes and divisive views of the past. 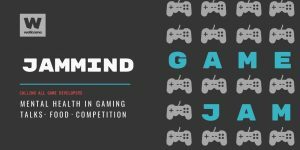 To contribute to these positive portrayals we have organised JAMMIND, a game jam focused on mental health, thanks to the support of the Wellcome Trust Institutional Strategic Support Fund (ISSF). It will take place at Cardiff University’s Hadyn Ellis Building on the weekend of September 28th-30th. The aim is to bring together the expertise of video game developers, academic researchers and mental health advocates to develop short video game prototypes that tackle some stigmatising aspects of mental health in a positive light. For an idea on what can be achieved using this approach I’d recommend a look at “Asylum Jam”, an annual online game jam which seeks to shatter the most common and harmful stereotypes around mental illness. If you’re interested in finding out more and contributing to JAMMIND please see our eventbrite page. This event is funded by the Wellcome Trust.